When I was studying Hebrew many years ago, this was one of the passages that we worked through in class. I remember two things about reading it in the original text. First, I was struck for perhaps the first time with how extraordinarily dramatic the story is. It has everything: suspense, irony, pathos and a surprise ending. Hebrew is even more direct than English, and the straightforward narrative heightens all of these elements. For example, every time the angel or the Lord speaks to Abraham about Isaac, he calls him “your son, your only son”. The addition of the second clause, “your only son”, simple as it is, loads each sentence with emotion and bittersweetness. There are many other stylistic elements throughout which make the story a masterpiece of literature, too many to list here. Immediately I realised that Isaac in this passage prefigures Christ, who also consented to die without resistance. And even though the foregoing interpretation of the text is not at all explicit in the Bible, I noticed that other elements of the story echo Christ’s sacrifice, like puzzle pieces that effortlessly fall into their right places. Isaac and Jesus both carry the wood by which they are to die up the mountain of sacrifice. Each one is the only, beloved son of his father. Both are to be sacrificed to a death that makes no sense in worldly terms. Of course, this was by no means a novel discovery: from the earliest times, the Church has recognised in this passage a foreshadowing of the death and resurrection of Christ. In the Book of Hebrews, Isaac is considered to have been figuratively raised from the dead; even the Jewish commentary cited above interprets the wood on Isaac’s back as the “stake” of his execution, sees a sign of resurrection in the fact that Abraham and Isaac took three days on the journey, and considers the ram as a foreshadowing of the Messiah. It is no coincidence that we hear the story of the Binding of Isaac proclaimed at the Easter Vigil every year. Let us then either consign Abraham to oblivion, or let us learn to be dismayed by the tremendous paradox which constitutes the significance of Abraham’s life, that we may understand that our age, like every age, can be joyful if it has faith. 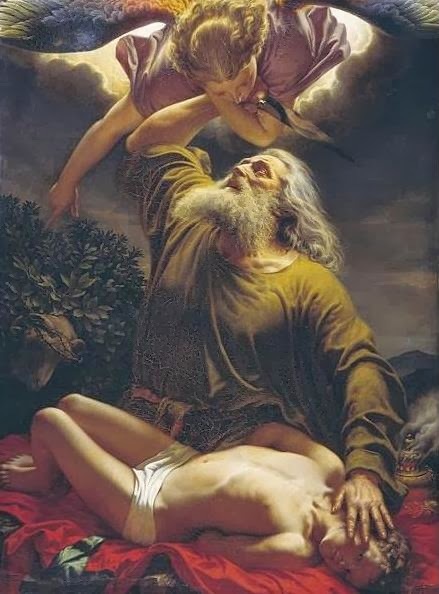 Kierkegaard is not the only person to have written a whole book about Abraham and Isaac, and there is nothing much I can add to this unfathomable story. But let us briefly consider one aspect of the allegorical sense of the story. [Abraham] stretched for his hand to take the knife while the tears streamed from his eyes, and these tears, prompted by a father’s compassion, dropped into Isaac’s eyes. Yet even so, his heart rejoiced to obey the will of his Creator. Only in faith can the terrible paradox of Abraham’s heart rejoicing at this moment even begun to be understood. It is a paradox that perhaps we can keep in mind during this Christmas season. For we worship a child who will be crucified; an infant whose infant neighbours are murdered by Herod and is yet to become the Prince of Peace.